Back cover blurb: Meet Rosemary, 86, and Kate, 26: dreamers, campaigners, outdoor swimmers... Rosemary has lived in Brixton all her life, but everything she knows is changing. Only the local lido, where she swims every day, remains a constant reminder of the past and her beloved husband George. Kate has just moved and feels adrift in a city that is too big for her. She's on the bottom rung of her career as a local journalist, and is determined to make something of it. So when the lido is threatened with closure, Kate knows this story could be her chance to shine. But for Rosemary, it could be the end of everything. Together they are determined to make a stand, and to prove that the pool is more than just a place to swim - it is the heart of the community. 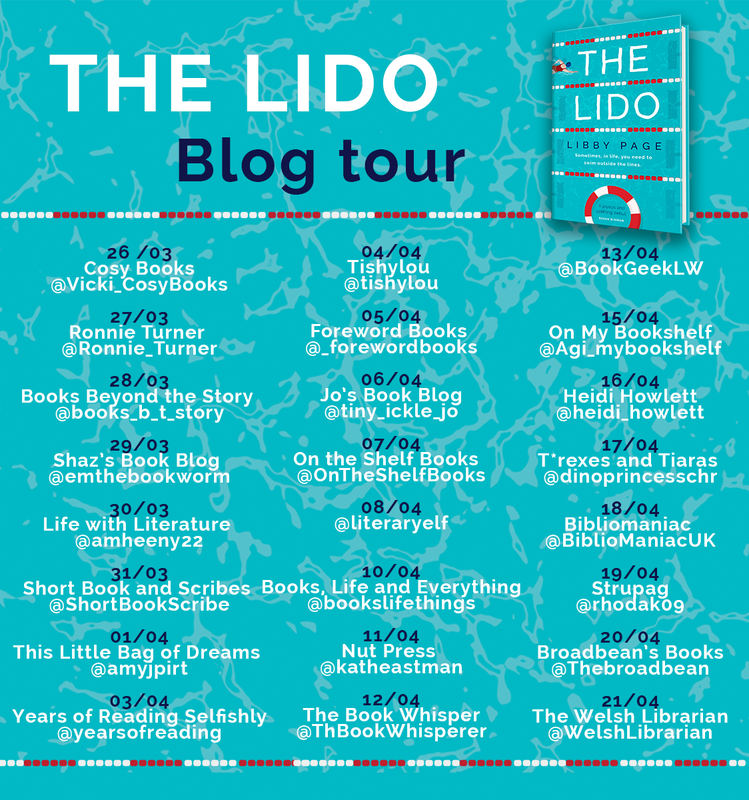 The Lido is an uplifting novel about the importance of friendship, the value of community, and how ordinary people can protect the things they love. Kate is a junior journalist at the local Brixton Herald is fed up with mundane stories and looking for something big so that she can feel valued as a reporter. The truth is, since moving to London, Kate is lonely and suffering from a crippling anxiety (the Panic) that no one knows anything about. When her boss asks her to cover the story of the local Lido’s potential closure, Kate is reluctant at first. It isn’t exactly the story she wanted, and she isn’t particularly a fan of swimming and truly doesn’t see how she can help. The Lido has been Rosemary’s life. She has so many memories of the past that are linked to the open air swimming pool, but is about so much more than that. Local community services closing like the library that Rosemary used to work in have meant that the community feel is being lost. Keeping the Lido would mean that Brixton would still have a service for all and a sense of community. As Kate becomes more invested in the story she becomes friends with Rosemary and in turn friends with Rosemary’s friends; local market stall holders, the local book shop owners and Kate begins to feel valued, wanted and that she might belong in Brixton after all. Jay her photographer at the paper is a great help as Kate outlines her plans for trying to save the Lido. He too becomes a great friend and Kate finally begins to believe in her own future. Sadly the Lido’s future is less certain, but Kate and her new found friends will be doing all they can to try and save it from closure. 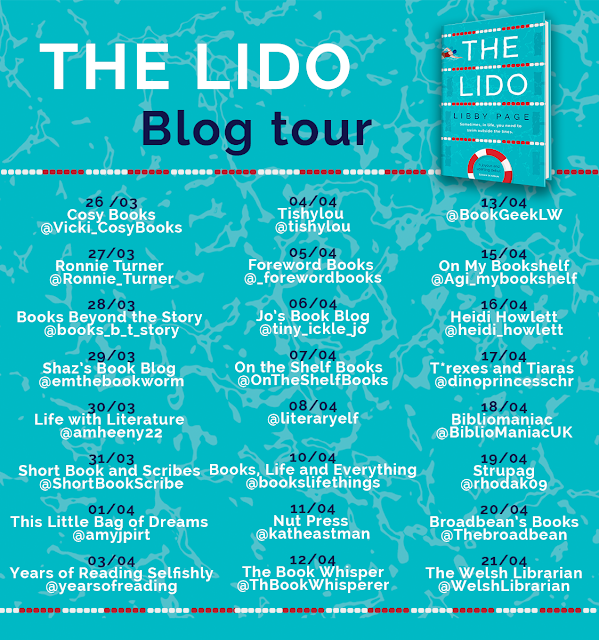 The Lido is a real lovely novel with community at its heart. As a former competitive swimmer I could almost smell the chlorine and definitely want to visit this Lido again. 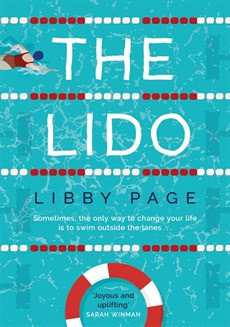 The Lido is available now via Amazon online and all good book shops.